Are your children’s immunizations up-to-date? This can be especially important during back-to-school time. In fact, the State of Ohio has mandated certain vaccinations as a requirement for school attendance. Schedule an appointment with your child’s primary care provider to receive these vaccinations prior to the beginning of the school year. If your child does not have health insurance; if their health insurance does not cover childhood vaccines; or if your child has Medicaid, you may receive these vaccines at little or no cost to you. Please call 513-946-7882 with questions or to schedule an appointment. Immunization requirements for school-age children were updated in the 2016-2017 school year. A dose of Tdap and MCV4 vaccine is required for all students entering 7th grade. Find Tdap and MCV4 vaccine at Hamilton County Public Health’s regular immunization clinics. What if my child received a Tdap or MCV4 recently? If a child received a Tdap after the age of 7, he/she should not receive the Tdap at this time and can consider this requirement fulfilled. If a child has received the first MCV4 vaccine, the second MCV4 will be due prior to entrance into 12th grade. There must be a minimum of 8 weeks between the first and second MCV4 vaccines. 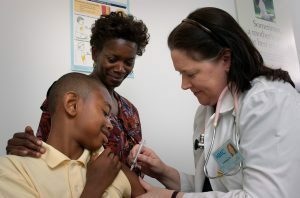 The Tdap (Tetanus, diphtheria and acellular pertussis) vaccine is important to protect adolescents and adults against tetanus, diphtheria and pertussis, commonly known as whooping cough, a disease that is highly contagious. The MCV4 (meningococcal serogroups A, C, W and Y) vaccine can prevent 4 types of meningococcal disease including 2 of the 3 most common in the United States. There are other types of meningococcal disease that the MCV4 does not provide protection against. Why should my child receive these vaccines? Due to the increasing presence of whooping cough, a dose of Tdap vaccine is required by the Ohio Department of Health for students entering the 7th grade. Whooping cough is a highly contagious disease that typically occurs in school age children. Vaccine protection from doses received during infancy diminishes over time, therefore an additional dose is necessary for optimum immunity. Meningococcal disease is a serious bacterial illness that is the leading cause of meningitis in children 2 – 18 years old in the United States. Two doses of MCV4 are required for school attendance in Ohio; the first prior to entering the 7th grade and the 2nd, prior to entering the 12th grade. Individuals can be provided vaccination regardless of insurance status. What are the risks associated with this vaccine? Both the Tdap and MCV4 vaccines are administered as a shot in the upper arm. There may be some pain, redness or swelling at the injection site, but severe reactions are unusual. More details can be found in the Vaccine Information Statement. How do I know if Tdap and MCV4 vaccines are medically appropriate for my child? Talk to your child’s health care provider about getting the Tdap vaccine if your child has had epilepsy, Guillan Barre Syndrome or a serious reaction to a previous tetanus shot. Talk to your child’s health care provider about getting the MCV4 vaccine if your child has had a serious reaction to a previous MCV4 vaccine. What if my child is ill on the day of the vaccination clinic? If your child is moderately or severely ill on the day of the clinic, you should wait until the child is recovered to receive the vaccination. What other vaccines does my child need? Click here for a full list of vaccine recommendations for every age from the CDC. Please contact our Nursing Program at 513-946-7882.